They’ve created exclusive paintings for the Grosvenor House Hotel on Park Lane in London and embassies across the world, as now this small group of freelance artists from the Philippines are planning on showcasing their artwork in the homes of the UAE! Why the UAE art market? Oakes describes the art collection as “Pinoy Art at its very best,” as the bold and bright work with hints of humour and charm would fit perfectly into the interior design and art market in Dubai. 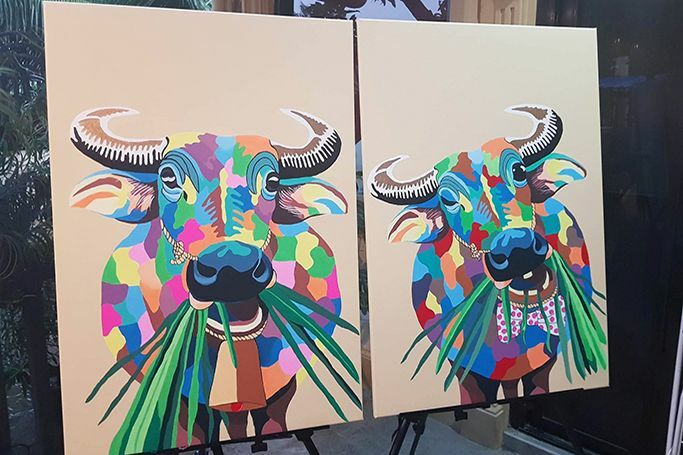 As creatives search for unique art in Dubai’s trendy Alserkal Avenue, we believe this art from the Philippines deserves a place in Dubai’s Al Quoz art district for its distinct spirit alone. When asked why Makati Arts want to make their move into the UAE art Market, Oakes explained that “the people living in the UAE have such a wide international audience and international taste AND huge white walls to fill!” Oakes believes that the art “offers a unique cheerfulness to any home” and we can’t disagree. From Camels to elephants and brightly coloured palm trees, the art range is fun, striking and still thoughtful. A Makati Arts trademark is budget prices, as a typical price (which includes post and packaging charges) for any 3ft by 2 ft painting is only AED 550 and the popular 4ft by 3ft AED 750. And delivery to the UAE only takes 10 days! Oakes continues that “there is a massive amount of people with hidden talents in the Philippines and [Makati Arts] never stop looking for talented people,” as the creative art group currently has 15 freelance artists with the majority of the group gifted students from the University of the Philippines and from the University of Tarlac. Their top artist is Eugene Mariano who has led the team for over 10 years –“he is a totally self-taught artist.” The talented and skilled group create pieces for an international art market, from Venezuela to China and now the UAE. As we’d love to see some of these Pinoy paintings displayed in homes and offices across Dubai!